Disney and LucasFilm's Star Wars spin-off Rogue One: A Star Wars Story was a bona fide hit right away, with an impressive opening weekend of $155 million, nearly making back its $200 million budget in its first weekend at the domestic box office. The sci-fi adventure has remained the top movie at the box office for two weeks in a row, and it is shaping up be make it three weeks in a row, with no new movies debuting in wide release this Friday. Today we have word that Rogue One has passed a new box office milestone, crossing the $600 million worldwide mark. Variety reports that Rogue One's Tuesday box office tally has pushed the worldwide gross to $615.8 million. Rogue One earned $22.5 million domestically at 4,157 locations on Tuesday, pushing its domestic total to $340.6 million in its first 12 days. The movie has passed Suicide Squad ($325.1 million) and Batman v Superman: Dawn of Justice ($330.3 million) to become the seventh highest grossing movie of the year. It still has some work to do to surpass the top six movies of the year, Zootopia ($341.2 million), Deadpool ($363 million), The Jungle Book ($364 million), The Secret Life of Pets ($368.4 million), Captain America: Civil War ($408.8 million) and Finding Dory ($486.2 million). 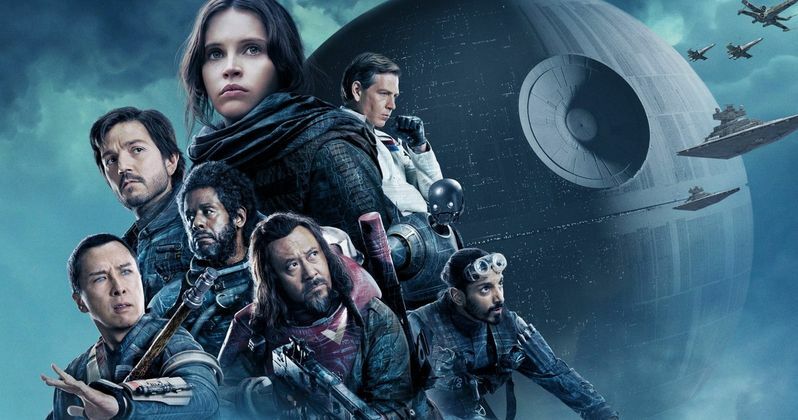 On the worldwide charts, Rogue One is currently in 11th place, with the top 10 featuring five movies that were distributed by Disney, or Disney-owned companies. As of now, only three movies have surpassed $1 billion, all of which have been released by Disney. Captain America: Civil War currently holds the top spot at the worldwide box office with $1.1 billion, followed by Disney movies Finding Dory ($1.027 billion), Zootopia ($1.023 billion) and The Jungle Book ($966.6 million), with Universal's The Secret Life of Pets rounding out the top 5 with $875.4 million. The top 10 is rounded out by Warner Bros.' Batman v Superman: Dawn of Justice ($873.3 million), 20th Century Fox's Deadpool ($783.1 million), the only R-rated movie in the top 10, Fantastic Beasts and Where To Find Them ($746.1 million), Suicide Squad ($745.6 million) and Doctor Strange ($656.5 million). The worldwide tally is even more impressive since the film hasn't opened in China, which has become one of the most important global box office markets. Rogue One will open in South Korea today, with China set to be its final worldwide market opening, hitting theaters in the Middle Kingdom on January 6. When Star Wars: The Force Awakens hit theaters late last year, the Chinese gross of $124.1 million was the second highest international market in the world, behind the $163.4 million take in the U.K. With two Chinese actors, Donnie Yen and Wen Jiang, starring in Rogue One, it's possible that Rogue One's Chinese box office tally could be even higher than Star Wars: The Force Awakens. From Lucasfilm comes the first of the Star Wars standalone films, Rogue One: A Star Wars Story, an all-new epic adventure. In a time of conflict, a group of unlikely heroes band together on a mission to steal the plans to the Death Star, the Empire's ultimate weapon of destruction. This key event in the Star Wars timeline brings together ordinary people who choose to do extraordinary things, and in doing so, become part of something greater than themselves. The cast includes Felicity Jones, Mads Mikkelsen, Alan Tudyk, Riz Ahmed, Diego Luna, Ben Mendelsohn and Forest Whitaker. Be sure to check back on Sunday to see how Rogue One fares at the box office this weekend.